There’s nothing better than coming home to a vibrant and happy atmosphere. It lifts you right up, even when you didn’t need it. Inside Out is a cozy store situated in Bandra full of little knick-knacks that fit perfectly in the nooks and crannies of your home. And they haven’t stopped there - they’ve got all sorts of funky stationery right from notepads to pouches to calendars and so much more. We don’t know where to start because once we do, we won’t be able to stop. Browse from a colourful range of abstract wall art and quirky coasters, cushions, mugs. Even though they found humble beginnings in Home Decor, they quickly expanded into most unique stationery products that we have seen. And if you’re one of those new-age stationery hoarders who’s just gotta have one-of-a-kind pretty diaries, then log on to their website or simply visit their store to be spoilt for choices. Make a statement with the Peacock Leather Handmade Diary or this Earthen Handmade Diary. They’ve also got a collection dreamcatcher keychains and badges with tiny little messages. And oh, if you’re at the store, then you must check out their handcrafted potpourri and scented candles that will light up all your senses. ...is their cute Christmas In A Jar. 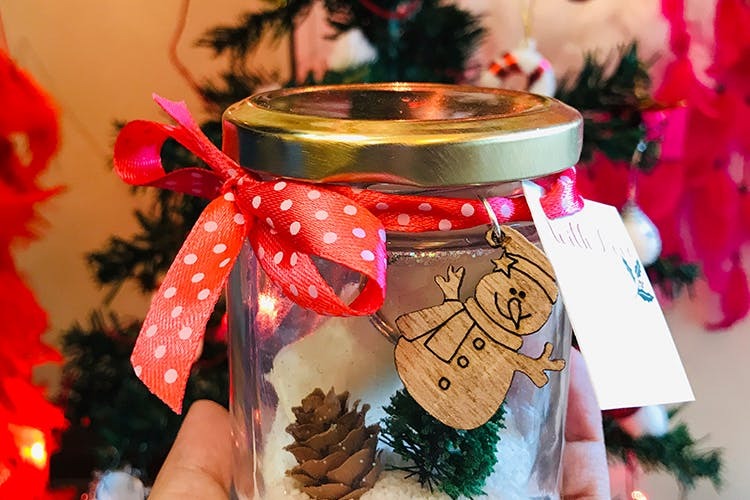 TBH we would love to buy everything, but this pretty little jar full of happy elements like miniature Christmas trees, pine cones, cute wooden charms, and red ribbons caught our eye. And each one comes with a personalized message, which makes it perfect if you’re still searching for an epic Secret Santa present. And if you love planning for the future, or know someone who does, then you can opt for the Mood Board to set goals and your New Year resolutions. It comes with 12 clips, 2019 calendar cards, and 35 changeable card options to doodle your aspirations, get motivated with pre-set affirmations, make things to do list, set fitness/work goals and quirky blurbs to keep your mood right. They also conceptualize and create customized designs to make sure you get what you came looking for. You can visit their store to place the order or do it directly from their website. Craving for some quirky stationery? Visit Inside Out, today!